Blended families, or stepfamilies, are now common in the United States. Nearly half of marriages in the United States end in divorce. 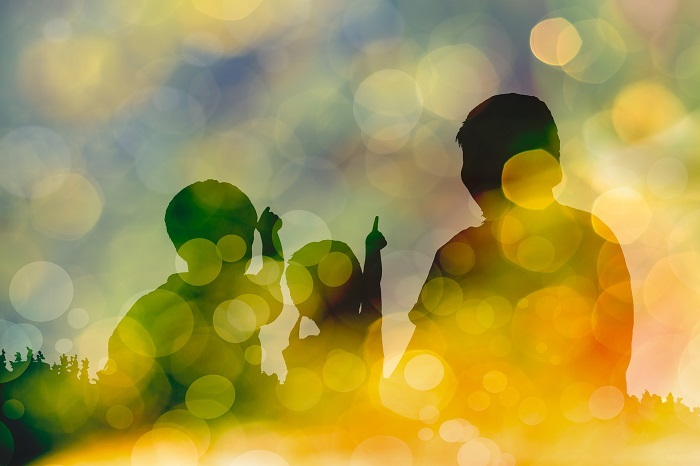 At least half of children in the U.S. live with a biological parent and a stepparent. This person might also be called a "bonus" parent. Bringing two parents and their children together can be challenging. Children may be used to different parenting styles and family routines. Visitation or conflict between separating parents can cause stress. Conflict between stepparents and parents that live outside the new family can also increase stress. Another point of potential conflict is any new stepsiblings. It can take time for children to adapt to the new family structure. It may help to speak with a therapist about the transition before it begins. Studies show 66% of second marriages involving children from previous marriages end. The stress all members of a new blended family go through may factor into this. Stress in a new family situation is normal. The transition may appear to have gone well. Even then, there is often some stress. The term "blended family" might imply a smooth transition. But the early years of a blended family are likely to be difficult. These challenges can occur even if everyone got along before living in the same space. The couple may have a hard time getting used to their new roles in the family. One or both adults will need to learn how to parent stepchildren. Issues with stepchildren can also bring tension into the relationship. Becoming a new parent in a blended family. Some adults enter a blended family with no children of their own. They will take on the parental role for the first time as stepparents. Getting used to this new role can cause even more stress. This can be difficult for someone entering a new relationship. It can be hard to balance being liked by a stepchild and parenting them well. It often takes time to adjust to parenthood. It can also take time to gain acceptance from a partner's children. Relationships between ex-partners and stepparents. When old relationships end, people may choose to move on and focus on their new partner. This can mean they stop communicating with their ex-partner. But this is often more complicated when children are involved. Children may wish to stay close to both of their biological (or first) parents. A court-ordered parenting plan could require the child to spend time with each parent. This can mean the remarried parent must continue speaking with their ex. In blended families, the ex may be called the non-residential parent. Some people feel threatened by their partner’s contact with their ex. Other times, the non-residential parent feels the stepparent is not treating their children fairly. Any of these situations can increase tension in a blended family. Strained relationships can make the adjustment more difficult. Children, especially older children, can also be stressed by change. More changes may mean more stress. Children are often affected the most by joining a blended family. They have already gone through their parents' divorce. Then, they must adjust to a new parent and new rules. They may express frustration through behavioral or emotional outbursts. Relationship between child and stepparent. Children may struggle with feelings about a new stepparent. They might be used to treating their parent's partner as a friend. Becoming a blended family can change this dynamic. When their "friend" takes on the role of parent, the child may come to resent them. They may feel their new parental figure seeks to "replace" their other parent. Children might also be reluctant to trust a stepparent. They may feel abandoned by a biological parent after a divorce. And when the child starts caring for the stepparent, they may struggle with new emotions. There may be worry that love for the stepparent betrays their biological parent. Relationship between child and stepsiblings. Sibling rivalry can also take on a new dimension. Children may feel they must compete for attention and dominance in the new household. A child might also worry their biological parents could start preferring their stepsiblings. Children may also bully a stepsibling. If a child is competitive or insecure, this could be more likely. Visitation and parenting plans. Visitation with the other parent can also cause trouble. The child may be used to spending unstructured family time every day. A parenting plan can make their life feel less flexible or spontaneous. Children can experience stress when structures they are used to crumble. Visitation can become confusing. Scheduling conflicts can create tension. New family members may have little time to get used to each other. Children may also complain about their stepparent to the non-residential parent. This can add tension to what may already be a strained relationship between separated parents. Grief and loss after divorce. Grief can also be a factor during the transition. A remarriage could takes place after the death of one parent. In this case, a child may still be grieving the loss of the other parent. A child may also feel grief for the loss of their old family dynamic. If so, they could be further triggered by a remarriage. Children may need more space and time to finish the grieving process. They can then come to accept the new parent at their own pace. I'm Fearful Around Some of My Stepmom's Family. What to Do?